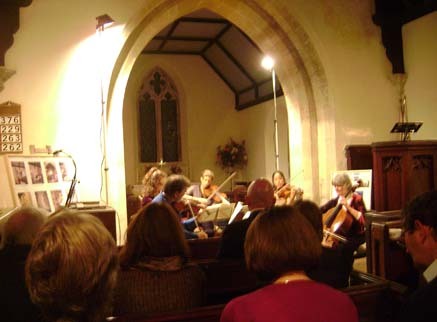 The completion of the project was marked by a classical concert in St James's church on Friday 10th September 2010. Performed by the string quintet Pentatonic (two violins, two violas and a cello) this wonderful group of professional musicians are friends who enjoy playing together when they have time off from national and international commitments and particularly love playing in small country churches. 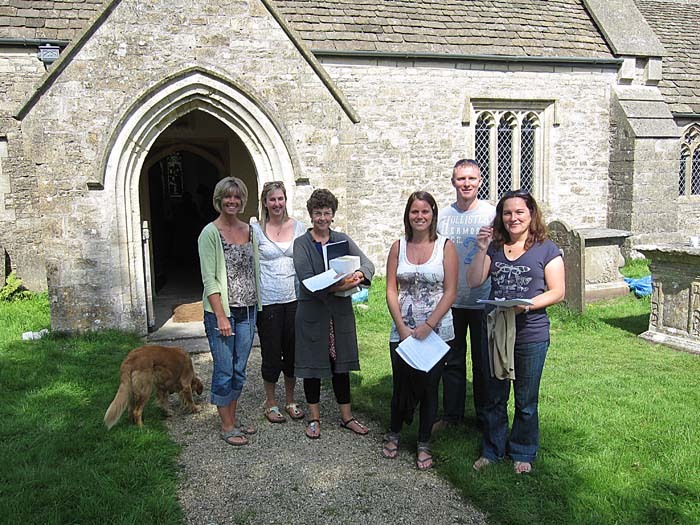 The concert was very much enjoyed by a large audience in the church and the event raised a sum of over £484 for Church funds. If you have Adobe Reader installed and would like to view the full poster used for the event click here. Head teacher Kay Pettifer and some of her staff make their preliminary visit to plan the school visit event for around 60 children. 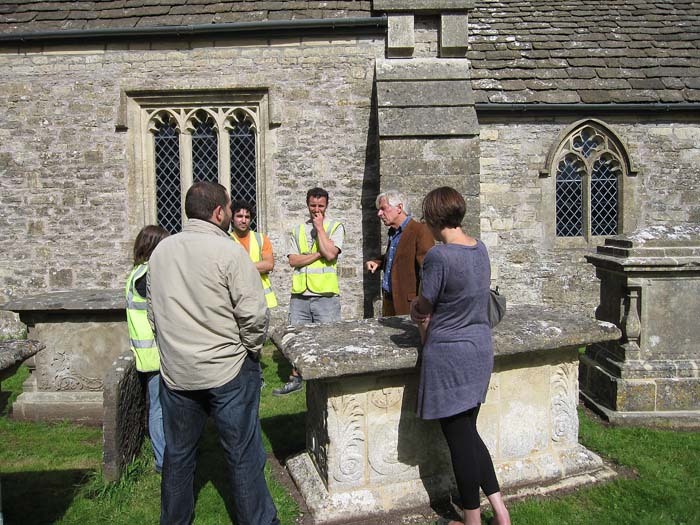 Corinne - Senior Conservator - explains what has been going on in the churchyard. 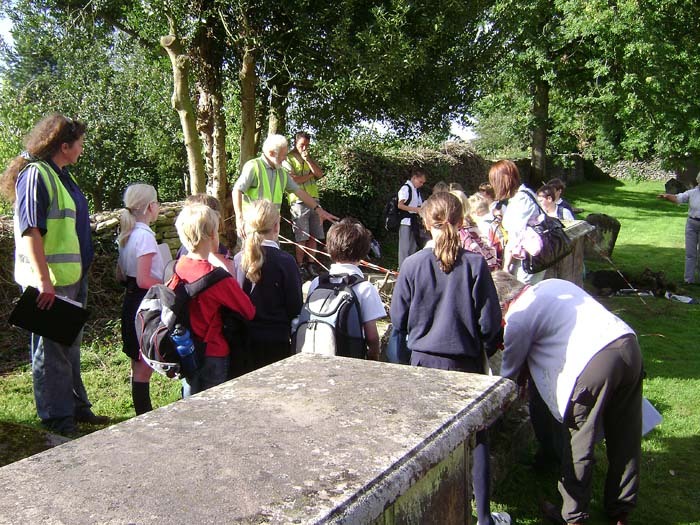 Gwynne Stock talking to the children about the walled graves found during the project. Corinne explains the inscriptions on tomb 3. 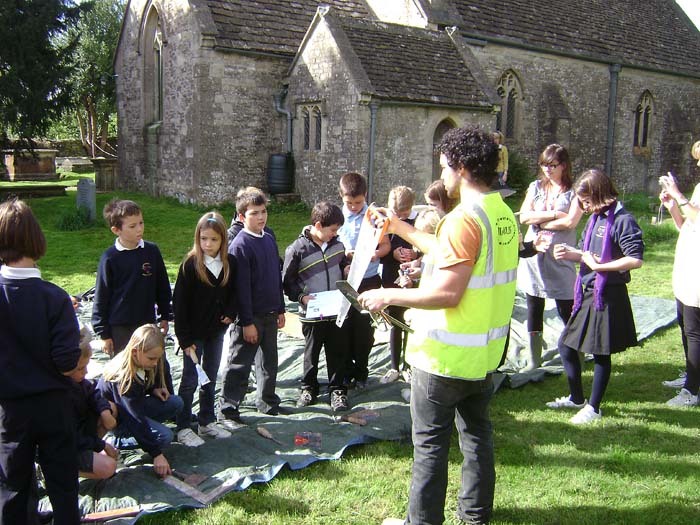 Joe shows the children the tools used for masonry work. Pupil enthusiastically chisels the stone. 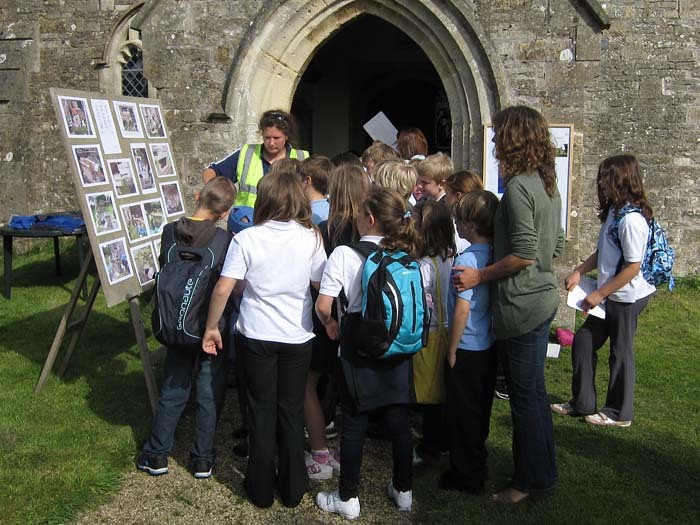 Pupils search for the answers to the Church Trail questionnaire. 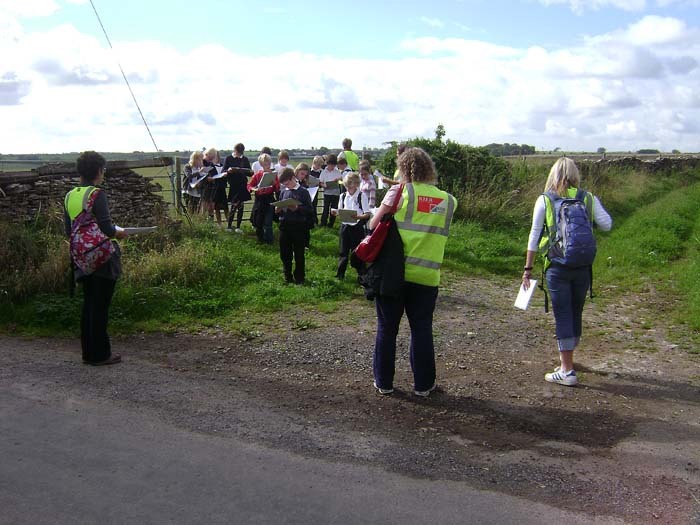 Pupils search for the answers to the Village Trail questionnaire. Confident pupil gives TV interview. 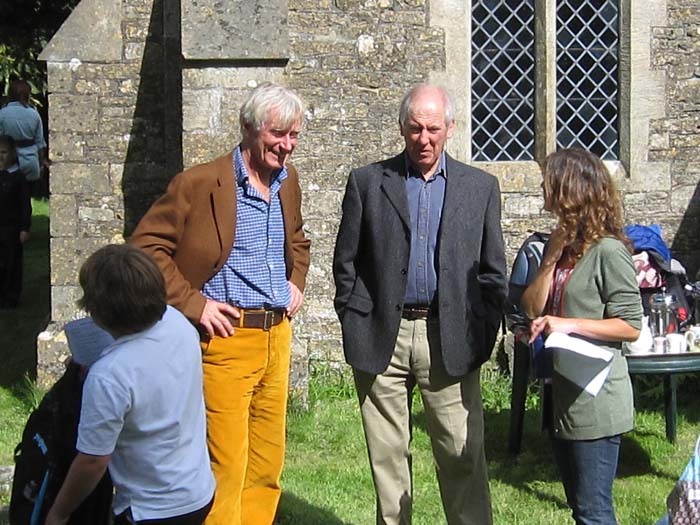 Sam Hunt (second from left) - Heritage Lottery Fund Committee Member - hears all about the project. 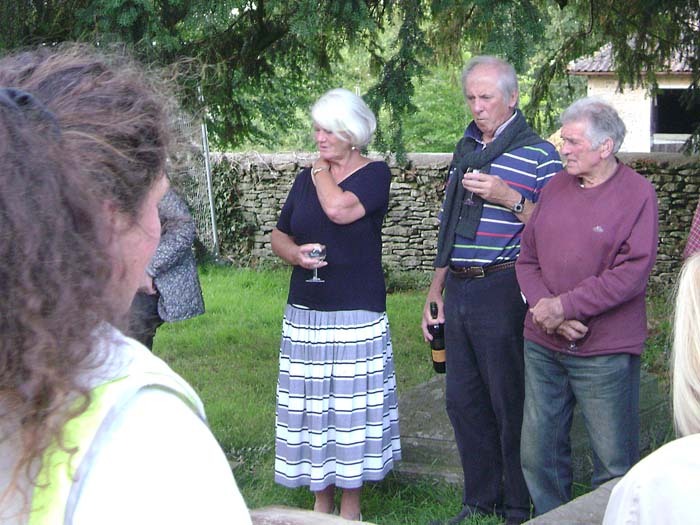 The Nimbus Director Jez Fry (foreground) with his team discuss the project with Sam Hunt (HLF Committee Member 2nd from right) and Angela Haymonds (Secretary of ICET right). David Adams - Project Coordinator is interviewed by the 'Points West' TV team. 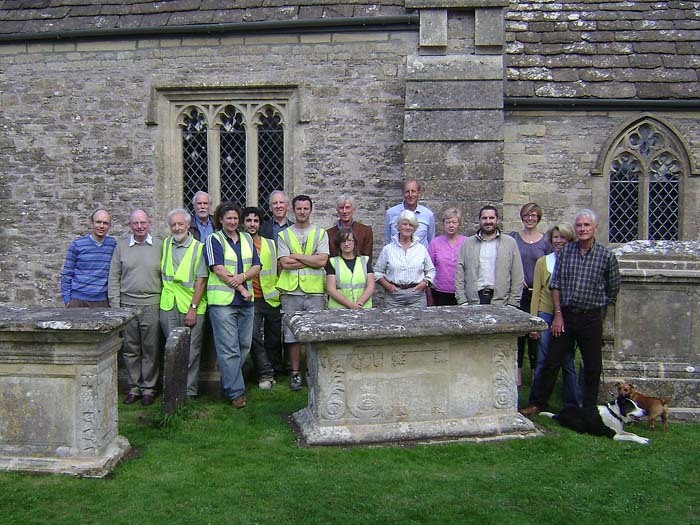 The Project Team with the Nimbus Team and the major sponsors representatives Sam Hunt (HLF) and Angela Haymonds (ICET), Simon Drew - Vicar of Marshfield group of parishes (left) and Gwynne Stock (3rd from left). 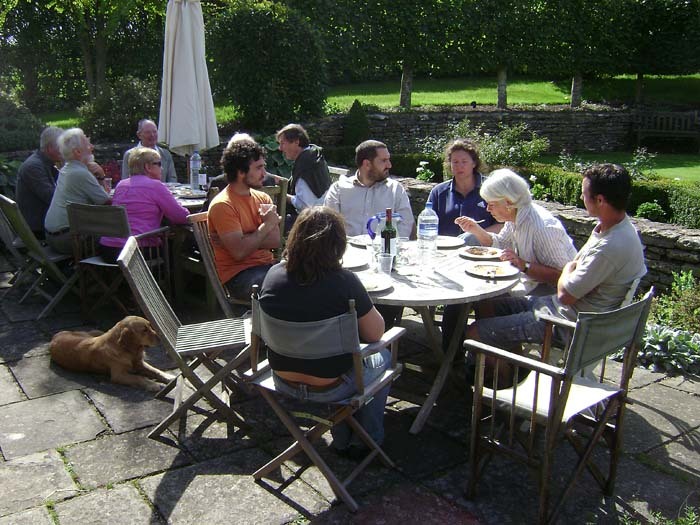 The Project Team host a lunch for the Nimbus Team to mark the end of the contract. 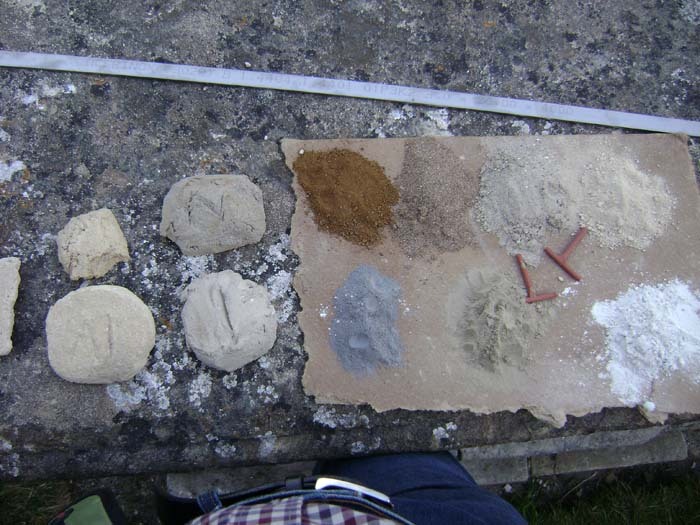 Colouring compounds used in conservation work. Group hearing about finds on tomb 8. 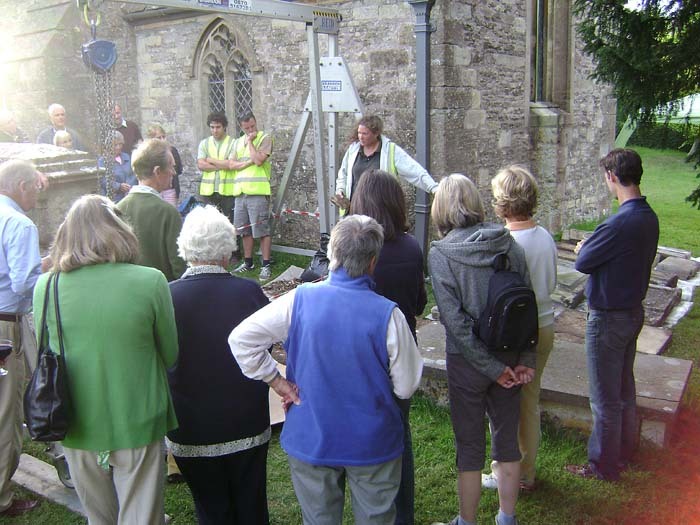 All interested parties hear about the project in St James's church. 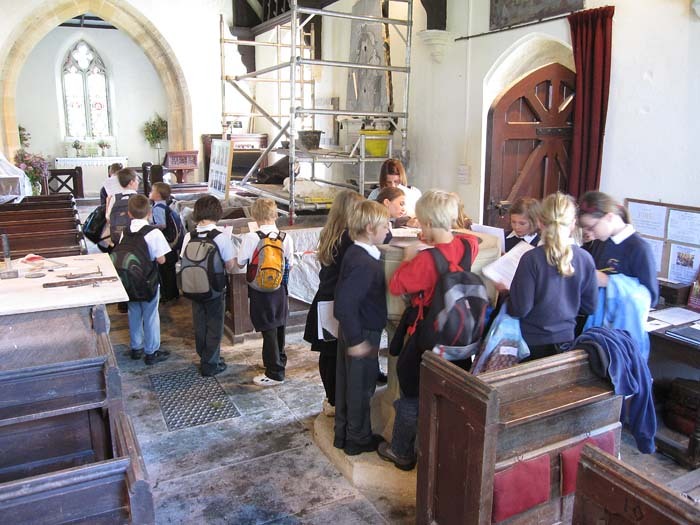 On 9th September 2010, around 60 pupils from Marshfield school visited West Littleton and St James's church. 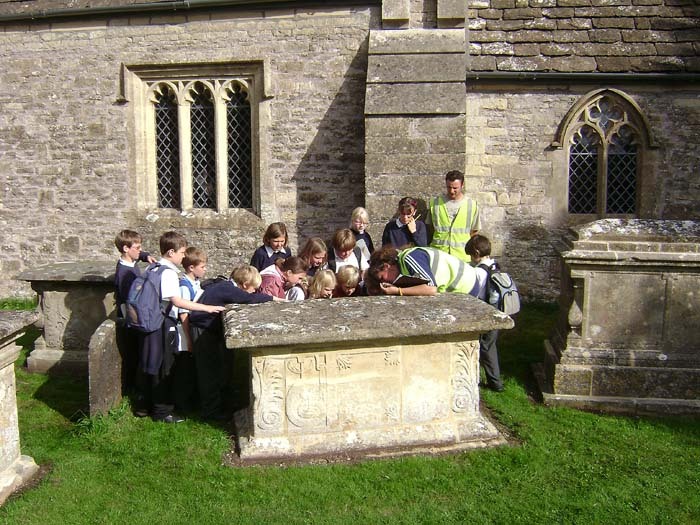 The objective of the visit was to give the children an opportunity to start learning about the history and heritage of the church and churchyard. 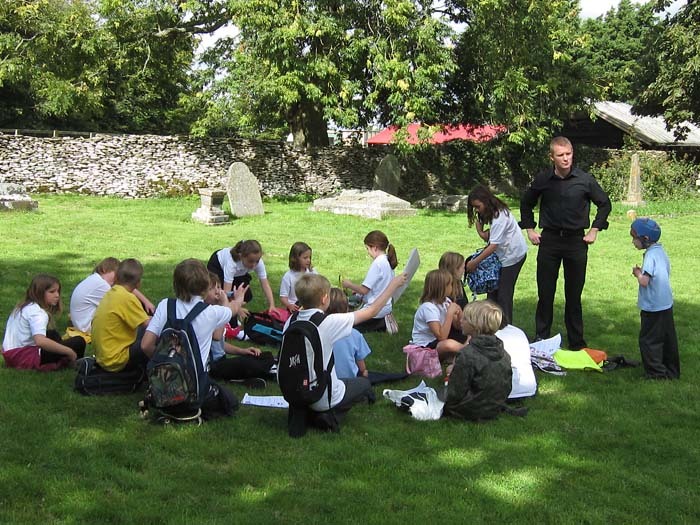 The pupils were split into four groups, each group completing a circuit of activities including a tour of West Littleton with the task of completing a questionnaire about historical aspects of the village, a church trail around the churchyard and the church with another questionnaire to be completed. 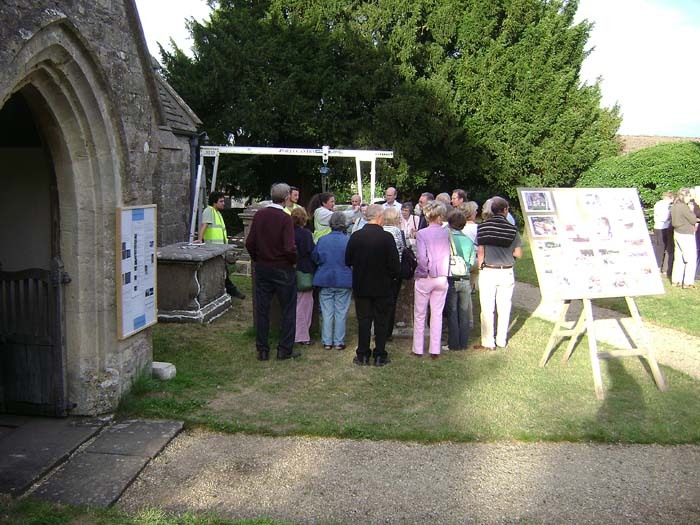 Activities in the churchyard included presentations on the work of conservation of the tombs and memorials and the special features discovered, learning about the local geology and its impact on the church and an opportunity to see an exhibition of the tools and materials used during the project. 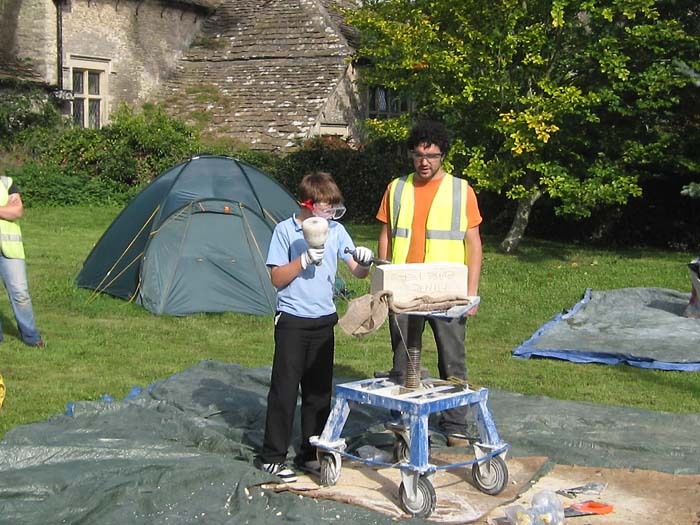 Some of the pupils were able to try out stone carving for themselves - a very popular activity! The visit attracted the interest of the local TV programme 'Points West' and the BBC were there filming the highlights of the event. 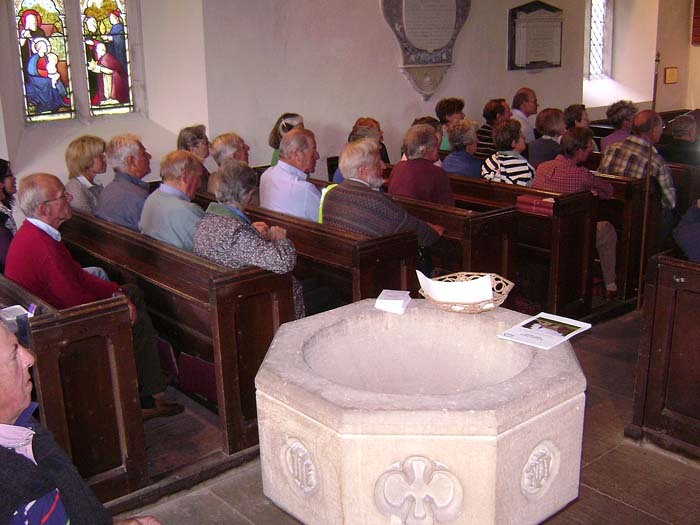 On the evening of Monday, 2nd August, over 50 people attended the presentation for the Marshfield and District Local History Society given by Nimbus Conservation about the work on the chest tombs and memorials at St James�s Church. It was a warm and fine evening which was perfect for strolling around the site and learning about the project. 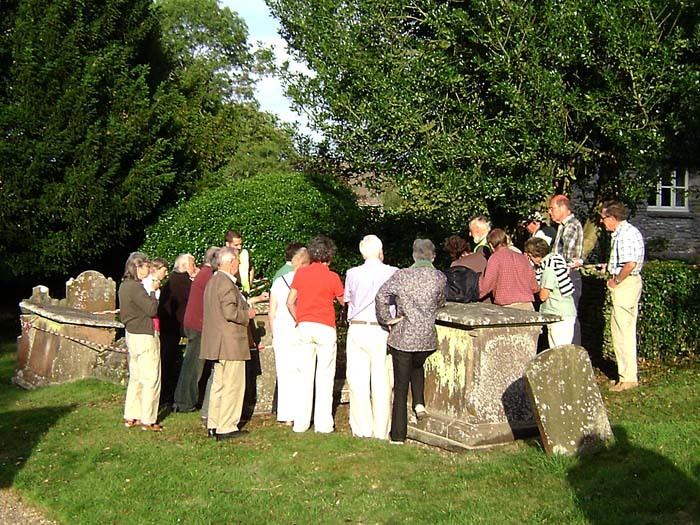 After a short introduction in the church everyone moved into the churchyard where the nine listed church tombs were at different stages of conservation. Some were simply being re-pointed and others were being completely dismantled to allow the foundations to be re-laid and stabilised. Jez Fry (Director) and Corinne Evans (Senior Conservator) explained the philosophy behind their approach to the project and demonstrated the techniques and materials being used. One of the dismantled tombs was laid out on display so visitors could see the full details of the construction. Local historian Gwynne Stock was also on hand to explain the details of a 19th century burial chamber which had been uncovered earlier in the day. 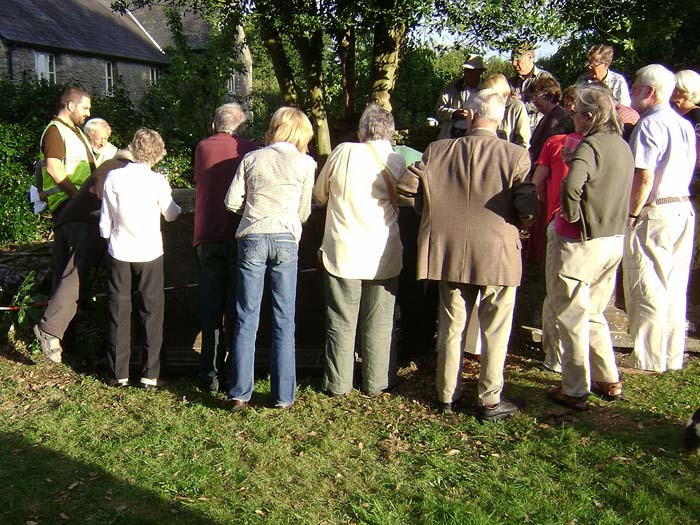 The original application to the Heritage Lottery Fund can be viewed here. Marshfield Primary School statement of intent. Church Trail Q and A. Village Trail Q and A.